The Firehouse Subs public relations person reached out to me to help promote the new cold deli subs now being test marketed in Baltimore. But in reality, it was only in the past six months that Baltimore was home to a Firehouse Sub, so everything is new. 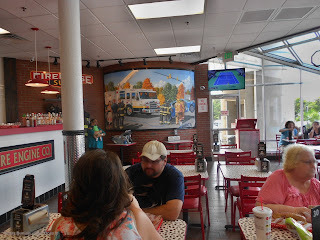 Firehouse Subs were started by two former firefighters, brothers in fact, Chris and Robin Sorensen. I had heard of the fast casual chain, although there was a lot I didn’t know: like since the 1992 inception they only sold hot subs, they raise money for local firehouses and charities ($14+ million donated to public safety organizations), they were already using the fast casual concept way back when, that each Firehouse Subs franchisee had a custom painted mural depicting the local firehouse, all the meats are cut fresh each morning, they were the first chain to add Coca Cola freestyle which allows you 120 plus combinations of sodas, a plethora hot sauces choices coded for heat level, that the table tops are designed to replicate Dalmatian’s spots, you can choose from optional 500 calorie sandwiches, that you are welcomed when you enter and thanked when you leave.